NASHVILLE, Tenn. - Police say they've captured one of six teens who were still on the run after a mass breakout by dozens of residents of a Nashville detention center. 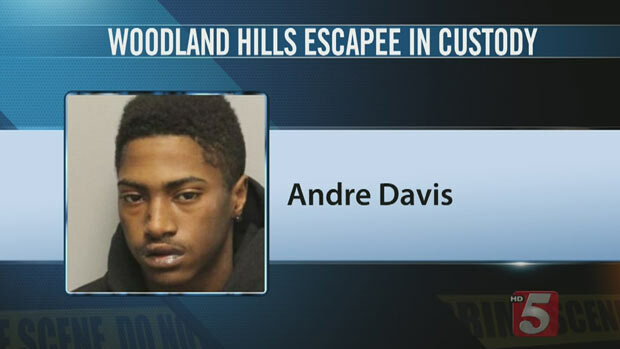 CBS affiliate WTVF reports Metro Nashville Police said 18-year-old Andre Davis was found at an apartment complex in nearby Hermitage and taken into custody on Friday morning. Five others who were being held at Woodland Hills Youth Development Center remain at large. More than 30 teenagers escaped from the facility late Monday. Staff initially thought the teens were contained in the yard but called police after they realized that offenders were escaping under a weak spot in the fence. Seventeen-year-olds De'Mario Fisher, Jaron Carrethurs, Kuyvonta Cain, Omar Manzanarez and Tajhiee Cockerham are still missing, according to the station. "Without assistance from others, these remaining five do not have the resources to continue sustaining themselves," said Chief Steve Anderson, according to WTVF. "As we work to bring them into custody, our officers will look closely at anyone who is knowingly providing assistance to the escapees. Those persons could potentially be charged with a felony for harboring or being an accessory." Police also said there had been a rash of car break-ins overnight at the complex where Davis was found, the station reports. They said officers would use fingerprints found at the scene to determine if Davis was involved in the crimes. Most teenagers at the center have committed at least three felonies. On Wednesday, two dozen detainees broke into the yard, wielding sticks and spraying a fire extinguisher. The center has a history of violent clashes, breakout attempts and attacks on guards. Anyone with information on the whereabouts of the escaped teens is asked to call the Emergency Communications Center at 615-862-8600 or Crime Stoppers at 615-742-7463.